First up, let me mention that Devils Pinch has eluded Sky and I on two previous occasions, so there was no way it was going to beat us this time. Warm & sunny weather was predicted for the weekend, and even though it was still pre-season apparently, there was no way I was going to waste it. I arrived at Newnes at around 9pm on the Friday night, with Kosta and Monica sitting beside a lovely fire and campsite away from the usual weekend riff-raff. Peggy, Wisam and Chee rocked in a little over two hours later, and it wasn’t much longer before we all settled in for the night. We left the campsite at around 8am for the walk to Looking Glass Canyon. Looking Glass Canyon starts with a fairly long firetrail bash to get to the bottom of the climb-up gully, but we made it in good time to the end of the trail. I was maybe a little hasty in my decision to cut up the side of the gully too early to get to the top of the ridge, as some scrambling and bush bashing was had, but it was fairly easy. After reaching the top of the ridge, it was a lovely jaunt though open forest on the top ridgeline, straight over to the entry through a side gully. Minimal fuss indeed. Before making the short and easy abseil into the upper canyon, we stopped for an early lunch at 11am, and basked in our last bit of direct sun we would see in a while. Lots of drops, one after another! After a little bit of creek walking in the open gorge section, it was not long until we reached the main canyon. This canyon has around 8 fairly easy drops, with an unfortunate number of them going straight into water. The water (as always), seems the be the exact upper leg depth (and temperature) that gives the most uncomfortable experience when first encountered. It’s like mother nature is mocking us! The canyon is short, but beautiful and winding. It looked like it could go on forever. After the junction with Firefly Canyon, and a few more nice abseils on the way out, it was a quick romp down the steep slope back to the firetrail. Only a short walk back to the campsite where we met up with Sky and Mary who seemed to be having a merry old time swigging down the Champagne in our honour. The campfire that night was a roaring affair, which could only be outdone by the most amazing feast I have ever had whilst camping. It seemed like we had all packed excess food, and the groaning of full bellies, and a days walking had been the ingredients for an early night. We bid Chee, Peggy and Wisam farewell as they had prior commitments back in civilization, and hit the hay. Another 8am start was on the cards for the next morning, and we got away in good time. We walked at almost record pace along the firetrail and up the Pipeline Pass to the saddle, stopping only briefly, as we were so pumped for the canyon. After a slight navigational error (sorry Kosta), it wasn’t long until we were down in the gully, past the creek walk and at the top of the first abseil. 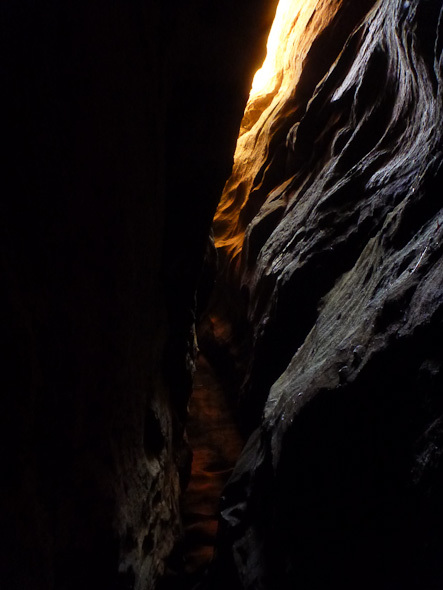 Devils Pinch starts with an awesome two-part abseil into an almost pitch black pit. Looking down the slot, it seems to go on forever. 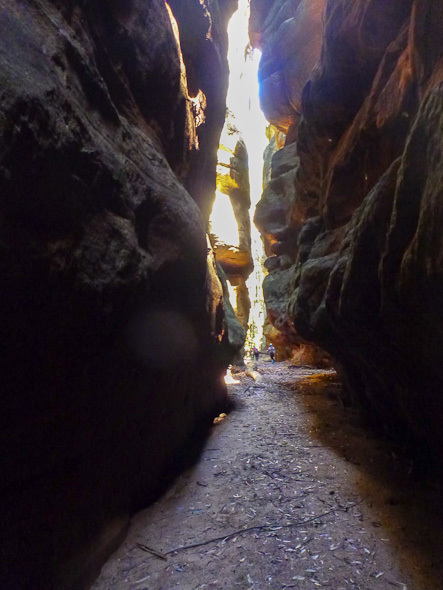 This canyon is also one that has to seen to be believed. We were all super impressed by the upper section, but that is just a teaser when it comes to the lower. It is truly spectacular. The high walls, twisting corners, long sections and tricky scrambles are what make this a practically ideal canyon for a early or end of season canyon. Not too much water, but enough to let you know that you are still alive. At the end of the lower section, we came to the often skipped 50m abseil down the waterfall. Kosta, Mary and Monica decided to do a single rope abseil down the slippery rock, and as such found that there is a second anchor now setup at the bottom of the first part of the abseil. Now there is no need to haul 2x 50m ropes through the canyon just for the last abseil. 2 x 30m is just fine now. Sky and I stayed at the top to release the rope before scrambling down the scrubby slope all the way to the river. All that remained was a fairly pleasant road bash back! Arriving back to the campsite, there were plenty of beers and celebratory snacks to be had which just topped off another wonderful weekend with some great people. Stay tuned for Episode 3!